What is a thermostat – how does a thermostat work? A thermostat is a mechanism that both tells the temperature and controls the heating or cooling system to maintain a consistent stable temperature. When a room, home or building’s temperature goes below a certain point, the system will turn on the heat, and if it goes above a certain temperature, it will turn on the cooling system. Once the area is either warmed or cooled to the desired temperature, the mechanism will then turn off the heating or cooling system. 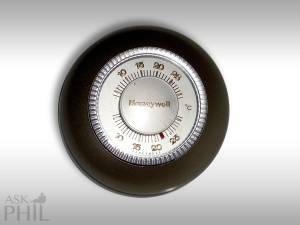 The two main types of thermostats are mechanical or digital. Most digital thermostats have advanced features such as programming to automatically turn the system on or off at a designated time or day of the week. The most commonly used sensor in mechanical thermostats is a bimetallic strip which uses two thin strips of different metals, such as brass and steel, copper and brass or copper and steel that are bonded together in a spiral coil. As the temperature increases or decreases the two different metals expand and contract at different rates. This causes the strip to bend, completing an electrical circuit activates the heating or cooling system. When the temperature raises or lowers to the set temperature, the metal strip moves, the electrical circuit is disconnected and the heating or cooling system turns off. Most modern homes have digital thermostats that were either installed in the construction or have replaced less efficient mechanical thermostats. Instead of physical sensors, such as those in mechanical thermostats, digital thermostats use electronic sensors to measure the temperature. The digital sensors work the same way physical sensors work; once a temperature goes above or below the desired temperature the heating or cooling system is activated until the desired temperature is achieved at which time the thermostat turns the heating or cooling system off. 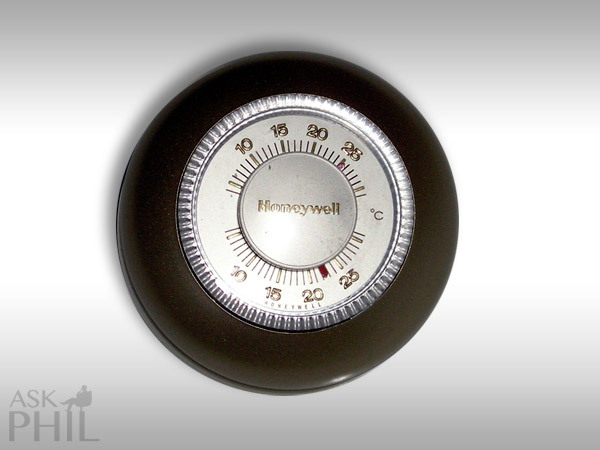 A mechanical thermostat is typically a dial or single slider switch that is turned or slid to the desired temperature. A dial type of mechanical thermostat has temperature numbers printed on it and the thermostat body has a marker, typically a line or small arrow. The users turns the dial clockwise or counter-clockwise until the desired temperature number on the dial aligns with the marker. A slider thermostat has a slider lever that will typically have line, groove or slot in the center of it. There is a slot on the thermostat with numbers on it representing the temperature, the user slides the lever either left or right or up and down (depending on whether the slot is on the top, bottom or one side of the thermostat) until the marker on the lever aligns with the desired temperature. Digital thermostats typically have a display screen with push buttons and possibly levers it to enter settings. More modern digital thermostats have replaced the buttons and levers with touch screen technology. Programmable models can operate the heating and cooling system at certain times, such as when people are sleeping or when people are at school or work. This makes a home not only more comfortable, but conserves energy and costs less money since the system doesn’t run unnecessarily, such as when people are not at home. More advanced models can have times when the heating or cooling system begins adjusting the temperature then fully activate the desired temperature when people begin to arrive, such as an office building or school. Temperatures are typically set to the desired comfortable temperature, however some people set the temperature off by a few degrees to conserve energy. Typically people consider approximately 70° – 72° Fahrenheit (21.1° – 22.2° Celsius) the most comfortable room temperature. However, most people typically don’t notice the difference between 72° and 74° (22.2° – 23.3° Celsius), so adjusting the desired temperature slightly higher can save both energy and money without affecting the comfort level. It’s recommended by some experts to set the heating system to activate at 67°Fahrenheit (19.4° Celsius) and the cooling system to activate at 77° Fahrenheit (25.6° Celsius). Temperature settings can be adjusted at different times of the year for weather changes and because people typically wear more clothes in the winter and less clothes in the summer even when indoors. Typically people are more comfortable at cooler temperatures resulting in people turning down the desired warmth temperature or turning up the desired cooling temperature while sleeping.